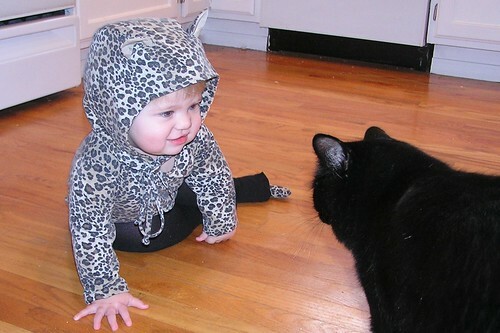 It occurred to me recently that I haven’t written much (if at all) about the dynamic between Catie and the cats. 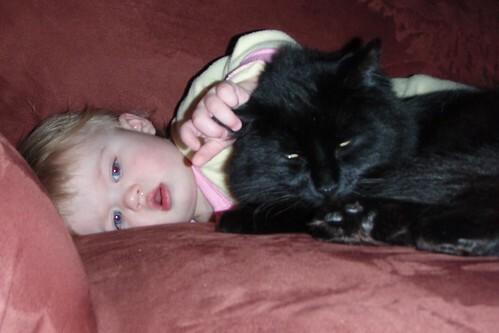 When Catie was a baby, Beaumont was her buddy. At first, he was just curious about this new strange thing we’d brought into the house. They quickly fell in love with each other. They were playmates. He would comfort her when she was sick. And after she became mobile, he followed her around all over the place. He seemed to get nervous that she might wander off. I would take Catie for walks around our neighborhood and Beaumont would follow right alongside with us. 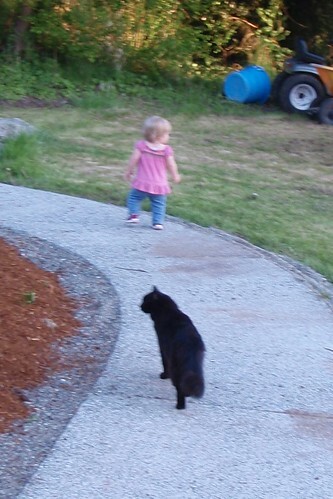 This was when we lived in the sticks, so we generally didn’t pass that many people, but a couple of our neighbors stopped and commented that they’d never seen anyone take their cat for a walk before. 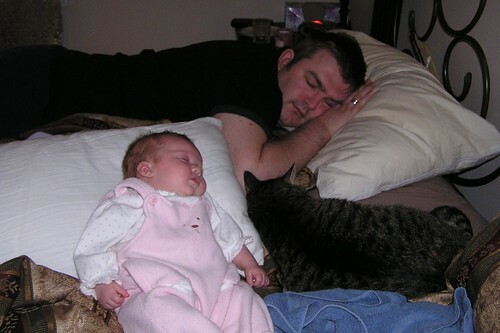 In fact, when we moved out here from Seattle and decided to re-home a couple of our cats, it was understood that even though Beaumont is painfully stupid and prone to annoying the crap out of me and Dave, we couldn’t possibly get rid of him because he and Catie had such a bond. Unfortunately, their relationship shifted when we moved to North Carolina. I’m not sure if it was the trauma of the move, or if Catie just got a little too big and manhandled him too roughly (both, probably), but he’s a little skittish around her now. I imagine that’ll change again, as time goes on. But the one dynamic that hasn’t changed is the one between her and Teenie. Teenie is my cat, always has been. I’ve had her since I was 20 years old. She seemed to understand from the time I first brought Catie home from the hospital that this new little creature belonged to “us,” somehow. When I was breastfeeding, I’d typically nurse Catie sitting in bed. I just found it to be more comfortable there than anywhere else. Teenie would sit on the bed in front of me, and if anyone came near me while I was nursing (including Dave and my mom, both of whom Teenie knew and trusted), she would growl, hiss, and swat them away. And over the past 3 years, that hasn’t changed at all. Teenie still loves Catie, and lets her totally manhandle her. When we come downstairs in the morning, the first thing they do is curl up on the couch together. Teenie is getting pretty old for a cat, she’ll be 14 this year. 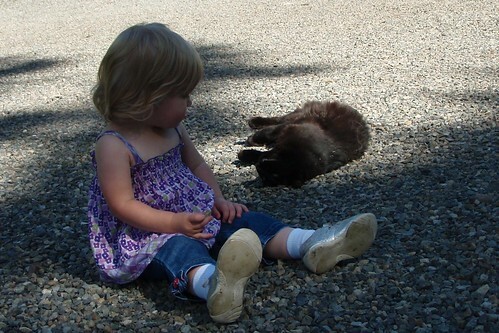 And I know it’s part of nature, and that our pets aren’t supposed to out-live us, but I dread the day that I have to explain the concept of Kitty-Cat Heaven to my daughter. Because seeing the two of them all happily snuggled up on the couch together is one of the highlights of my day. 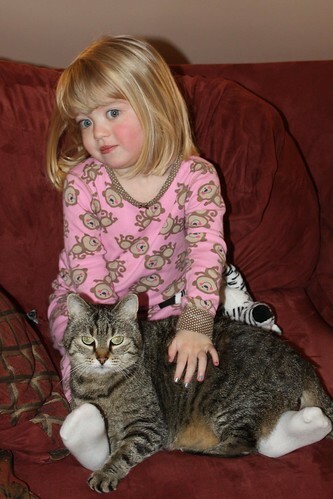 This entry was posted in Cate, Pets and tagged Catie, cats, Pets, toddlers by Cindy. Bookmark the permalink. OMG! These are the cutest pics ever! No wonder these snuggle moments mean so much to you… they are priceless! When I was 6 months old my parents acquired a siamese cat. 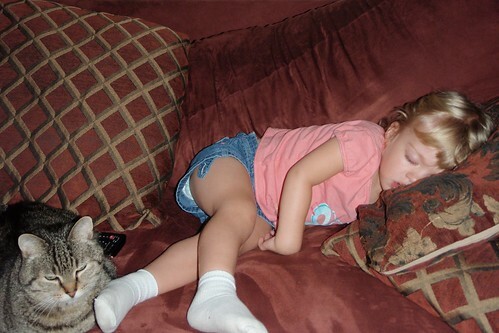 Everyone in my mom’s family told her how cats were horrible around babies, saying they were crazy to get a cat. Mom ignored them. 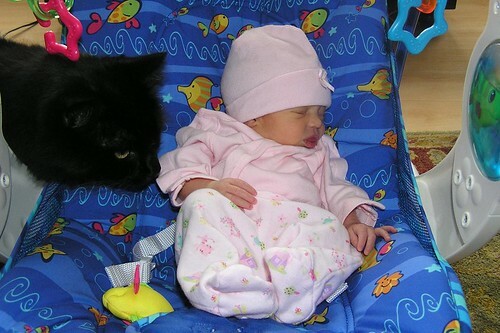 One day she was watching me while on the phone, I was sleeping in my car seat. Our cat walked up to me, sniffed me, then gently stepped into my lap and curled up, and went to sleep. awwww! I love pictures of my doggy with my girls. I worry about explaining doggy heaven, too. Yay for pets!! This makes me want a cat. Cuteness! Love the 1st picture of little bitty Catie. It’s funny how our pets know things and LOVE us unconditionally! That picture of Catie outside? In the purple tank top? That is just a priceless photo. Those are my favorite types of photos. So beautiful. So simple. Just amazing. I’m 5 mos pregnant and we have a dog and cat. A friend of ours hates our dog because he’s convinced she’s horribly misbehaved, so when I told him we were keeping the dog when the baby gets here he was absolutely disgusted. I told him to keep his opinions to himself because we like our dog a hell of a lot more than we like him. That’ll teach him!